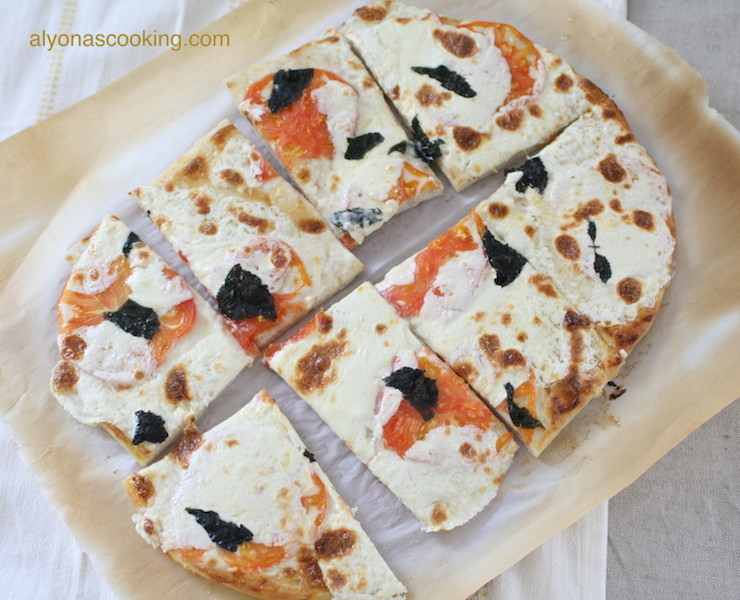 This Grilled White Pizza is amazing! You can never achieve the texture of a grilled pizza in an oven. The grilling technique for the dough allows the inside of the pizza dough to fluff up nicely and leaves beautiful grill marks on the outside resulting in a gourmet taste that’s not only beautiful, but tastes Delicious! This recipe makes three (about 15″ by 10″) rectangle pizzas. 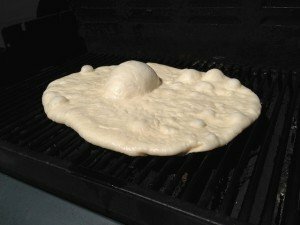 After some rising time I grill each piece of dough on the grill just to leave grill marks and fluff up the dough then I finish off by broiling in the oven for toppings to melt. If you grill the pizza with the toppings on the dough can burn and the topping can not melt thoroughly so I highly advise to finish off in the oven. This pizza freezes so well too! Just fully arrange toppings on each pizza after the grilling process and cover with ceramic and freeze. 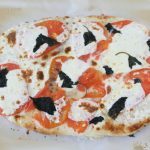 I hope this post may encourage you to try grilled pizza at home, it’s really not that complicated. Try it! P.S. To achieve a crispier crust, roll out each piece of dough by a few inches longer, grill and then bake in the oven for 10-15 minutes at 400 degrees F instead of broiling. If you decide on freezing your pizza’s allow the grilled dough to cool completely and then arrange each pizza with any topping you prefer, cover with wrap and freeze. To bake frozen pizza just preheat oven to 400 degrees F and bake for about 20 min or until toppings melt nicely. 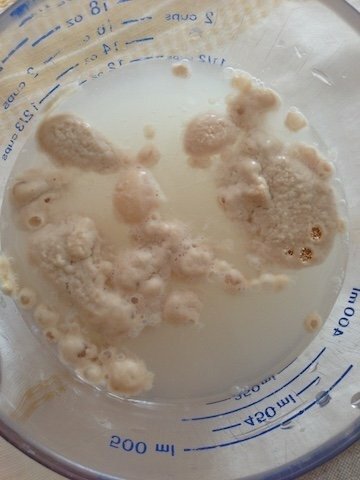 Combine the yeast and warm water in a measuring cup and let sit until foamy. Meanwhile combine the flour, sugar and salt in the bowl of a stand mixer. 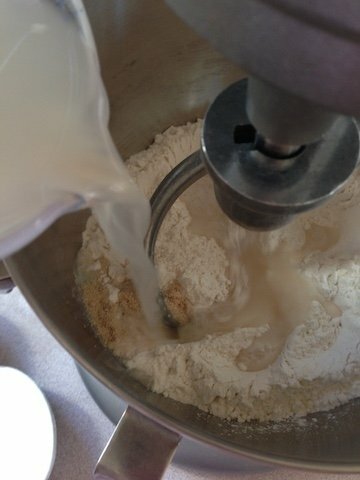 Add the yeast mixer and oil to the flour and mix on low-speed for 10 minutes. 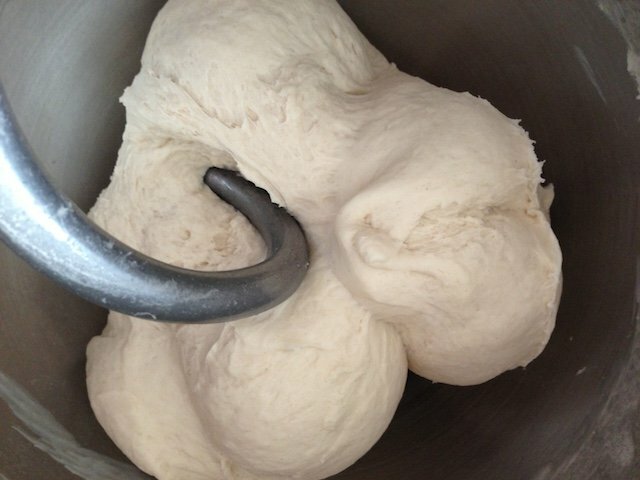 Dough should have formed into a ball. Cover dough and let rise for about an hour in a warm place (or until doubled). When dough has risen transfer onto a floured surface and cut into 3 equal pieces. Shape pieces into balls and roll out each ball into a 15″ by 10″ rectangle. 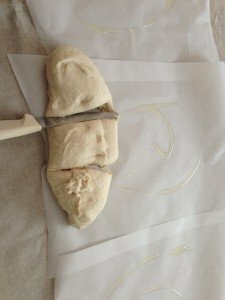 Place each rolled out piece of dough onto greased pieces of parchment paper. Grease tops and sprinkle with some salt. Allow rolled out pieces of dough to rise on parchment papers for 25 minutes. While dough is rising prep the toppings and preheat grill to medium heat. 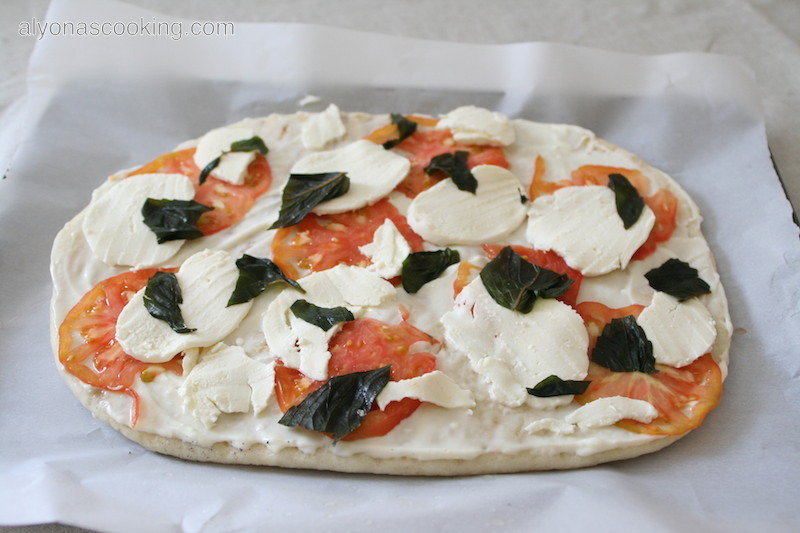 Ingredients for white pizza: fresh mozzarella, tomatoes, basil & white sauce. 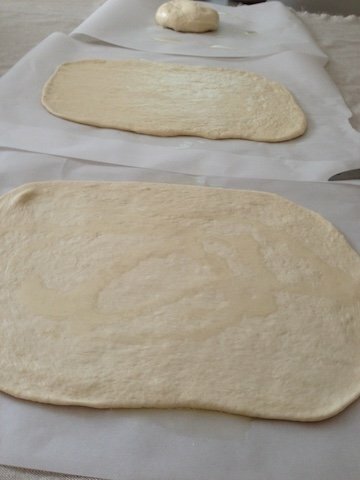 When dough has slightly risen place dough with parchment paper onto a large tray and bring to grill. 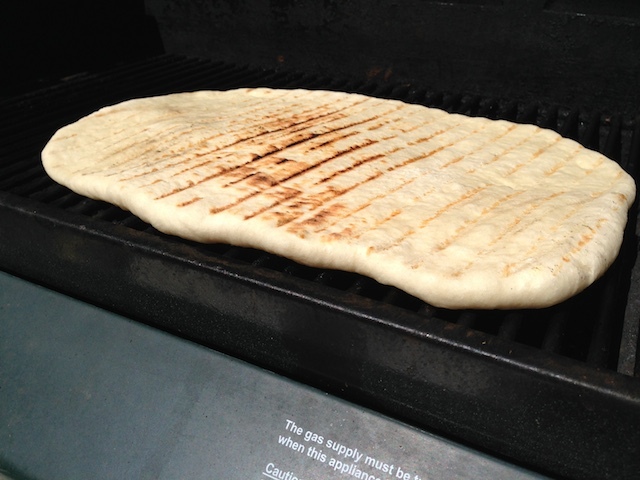 Place dough on the preheated grill (about 300 degrees F/medium heat setting on the grill). Flip top side down and peel off the parchment paper working with one piece of dough at a time. Grill the dough for about a minute or until dough starts getting bubbly. Do not keep long otherwise dough can burn, keep your eyes on the dough. After about 1 minute flip dough over using a spatula and grill for another minute. Dough shouldn’t stick to grill. Stack grilled dough on a large tray. 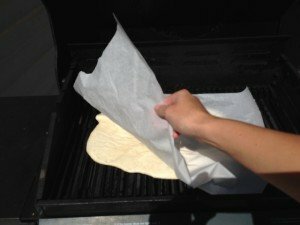 Place grilled dough back on parchment paper and place on a baking sheet, working with one piece of dough at a time. 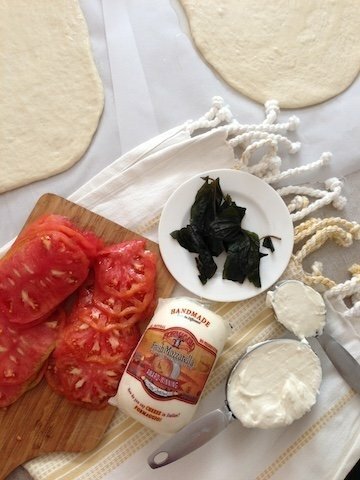 Spread 1/3 cup of white sauce over the dough and top with tomatoes, cheese and basil. Broil in the oven (middle rack) for 7 minutes or until toppings melt nicely. Repeat arranging toppings with remaining dough. After toppings have melted; remove pizza from the oven and slice. Enjoy! 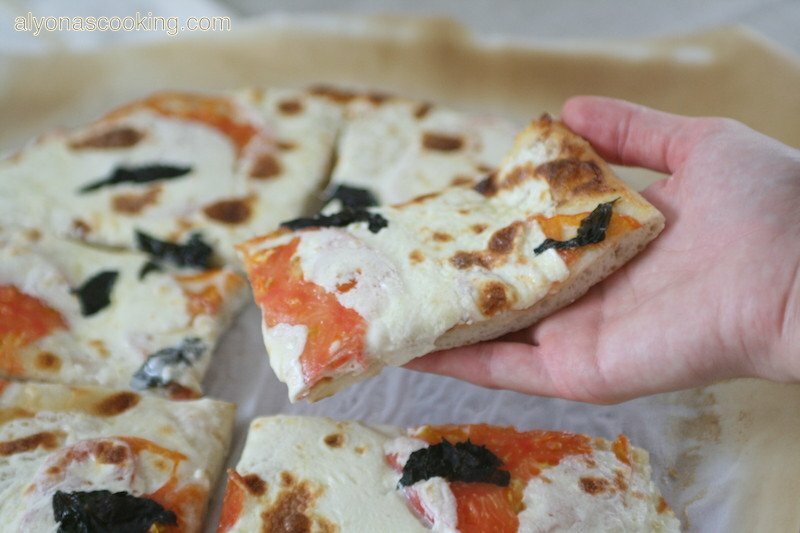 This Grilled White Pizza is amazing! You can never achieve the texture of a grilled pizza in an oven. 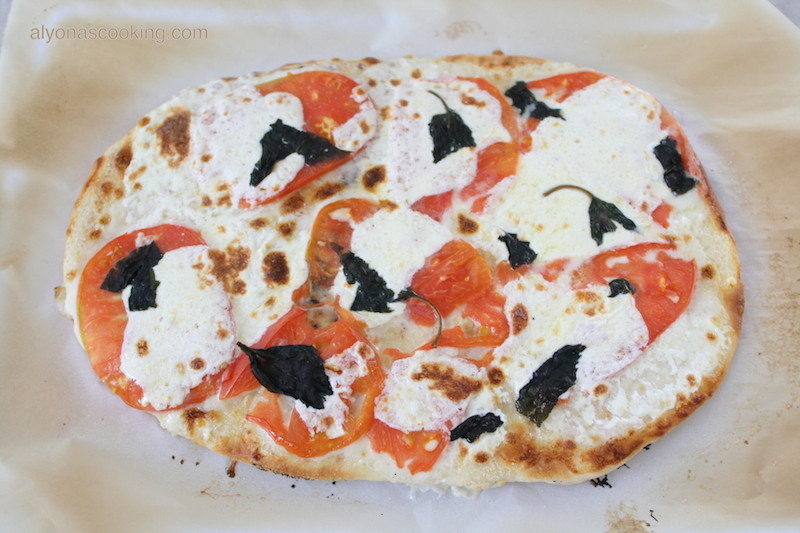 The grilling technique for the dough allows the inside of the pizza dough to fluff up nicely and leaves beautiful grill marks on the outside resulting in a gourmet taste that's not only beautiful, but tastes Delicious! Combine water and yeast in a measuring cup. In the bowl of a stand mixer combine the flour, salt and sugar. Add the yeast mixture and knead on low-speed for 10 minutes adding more flour if needed to form a ball or until dough no longer sticks to sides of the bowl. Cover bowl and let rise for about an hour or until dough has doubled. 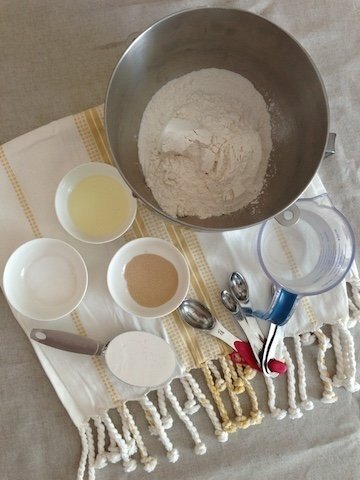 Remove from bowl and transfer dough to a lightly floured surface. 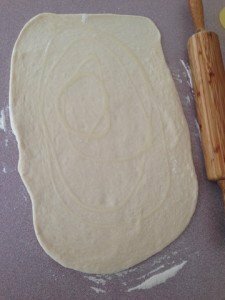 Cut dough into three equal pieces and form into balls. Roll out each ball into a 15" by 10" rectangle. Place each rolled out piece of dough onto a greased piece of parchment paper and grease tops. Sprinkle tops with a little salt. Allow dough to rise on parchment papers for 25 minutes. While dough is rising prep the toppings for pizza and preheat the grill to medium heat. Working with one piece of dough at a time, place dough with the parchment paper on a large tray and bring to the grill. Place dough onto preheated grill top side down and peel off the parchment paper. Grill each side for one minute, keeping your eye on the dough to prevent it from burning. Stack grilled dough on a large tray and turn off grill when all three pieces have been grilled. Place grilled dough back on parchment paper working with one piece at a time and spread with 1/3 cups of white sauce. Then arrange pizza with tomatoes and cheese and garnish with basil; broil in the preheated oven (middle rack of the oven) for 7 minutes or until topping melt.